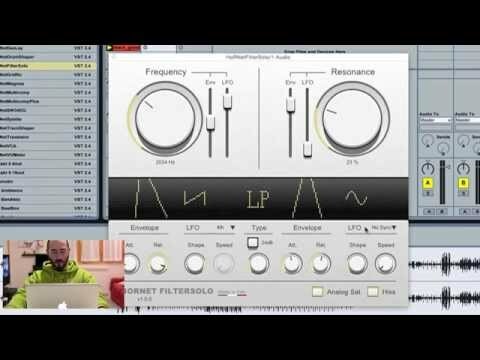 HoRNet FilterSolo it’s a resonant filter with many modulation possibilities and analog emulation. It’s a perfect creative tool for sound shaping and design. The filter itself is a high quality digital model with analog front-end and back-end, if you use a hot signal on it’s input and leave analog emulation on, you can hear it distort like a solid state unit would do. FilterSolo offer four different filter type: low pass, high pass, band pass and band stop with 12dB or 24dB slope. Each of the filters has cutoff and resonance freely adjustable. These two main controls can be independently modulated with two different envelope followers that has independent attack and release settings ranging from 10ms to 1s. In addition to the envelope followers you have two different LFO that can independently modulate the cutoff frequency or the filter resonance, the LFO speed can be free or synced to the host tempo. Both modulations options (envelope and LFO) can be positive and negative allowing you to create a wide range of moving and interesting sounds. If you don’t like the analog saturation or the hiss you can turn off any of them separately. The GUI let’s you quickly adjust any parameter since they are all exposed, there isn’t any modulation matrix hard to grasp and no multiple pages. Every parameter is quickly displayed in the big LCD display in the middle of the plugin.